Geometric tile patterns create a one-of-a-kind look and add spice to every room that they’re featured in. Geometry has found its way into the kitchen, living and dining rooms, kids’ rooms, master bedrooms, baths—and even outdoors around hot tubs and spa features. Geometric tiles perk up a room and form unique patterns that create a backstory that sets the tone for the rest of the décor. 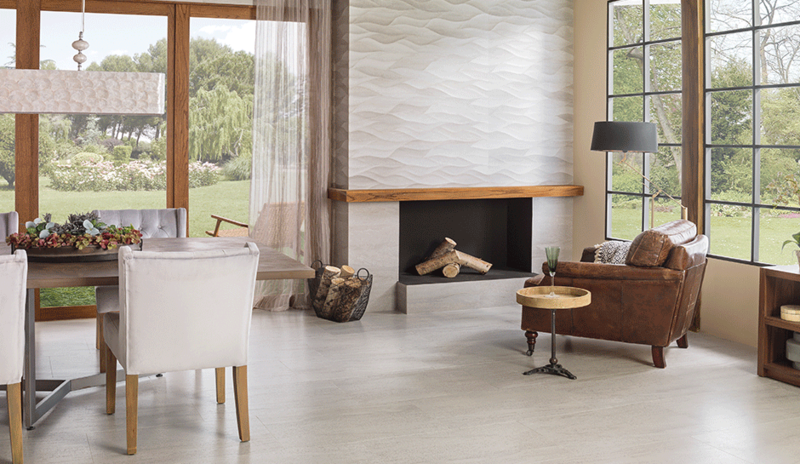 Forest Chelsea Nut is a superb geometric tile pattern choice. 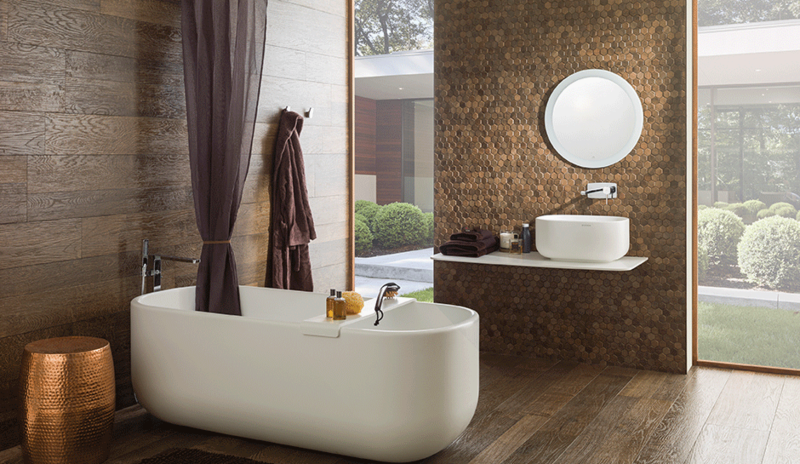 Used as an accent wall in a golden bathroom with warm brown hues, Forest Chelsea Nut adds rhythm and movement to the space. While some designers might want to minimize additional colors or patterns, geometric tiles are meant to be conversation-starters and anything goes. 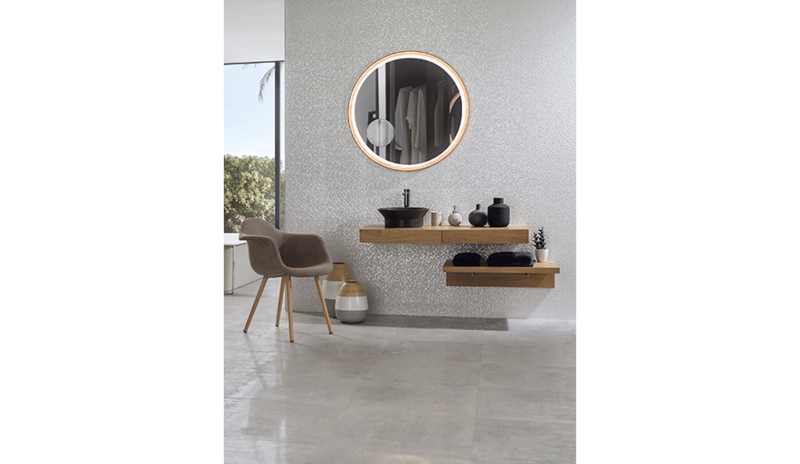 If you favor a simpler geometric tile, Cubica Blanco offers a stunning wall tile that while light in color allows you to coordinate furniture and accessories without clashing. 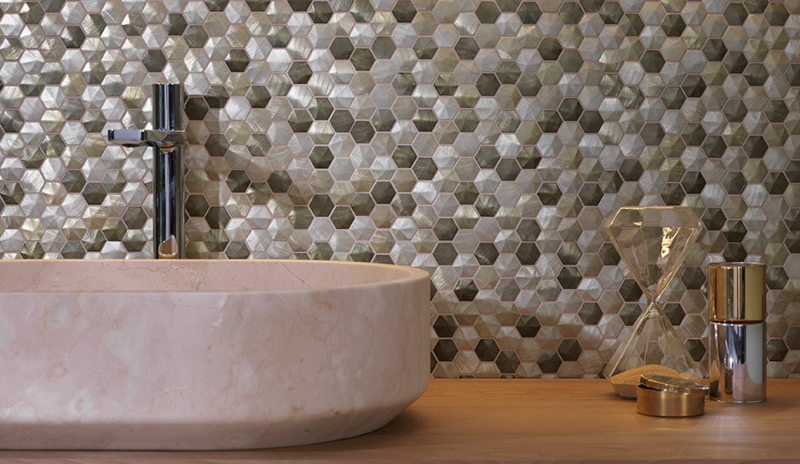 Colors Aluminum Olive or Colors Aluminum Space are ideal choices for a geometric tile backsplash in a bathroom. The flash of color these tiles add is undeniably beautiful. Geometry’s origins go back to 3,000 BC in ancient Egypt. Egyptians used geometry to survey land, construct pyramids and to understand astronomy. Around 2,900 BC, Egyptians began constructing pyramids with four triangular faces and a square base. Today’s geometric tiles offer the same mix of squares, triangles and rectangular pieces as ancient days and like the past, ornamenting a floor or wall with geometric tiles will tell a story, just as the Pyramids did. Patterns can be as simple as black-and-white geometric tiles with bright white grout and fresh white walls or a mixture of colors, sizes and shapes. Many homes feature a neutral color palette on the walls, so adding bold geometric patterns on the wall or floor makes a lasting impression. 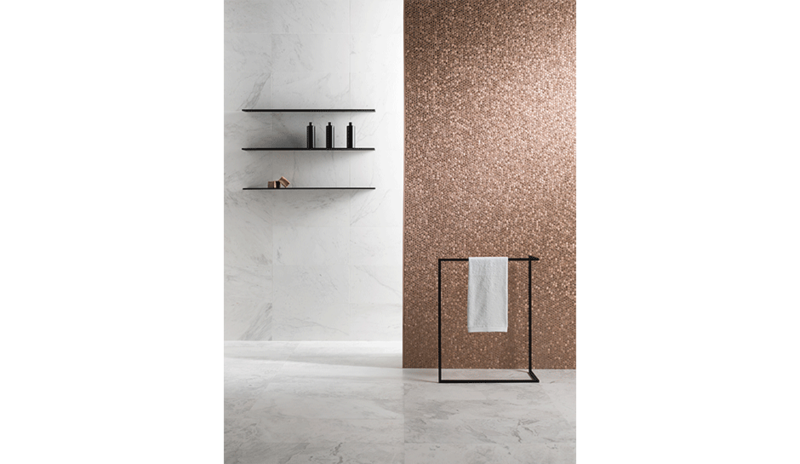 Not all tiles have to be square and Amsterdam 2D Hexagon Beige is a hexagonally-shaped tile that is stunning on a living room wall, against a freestanding bathtub or as a kitchen backsplash. 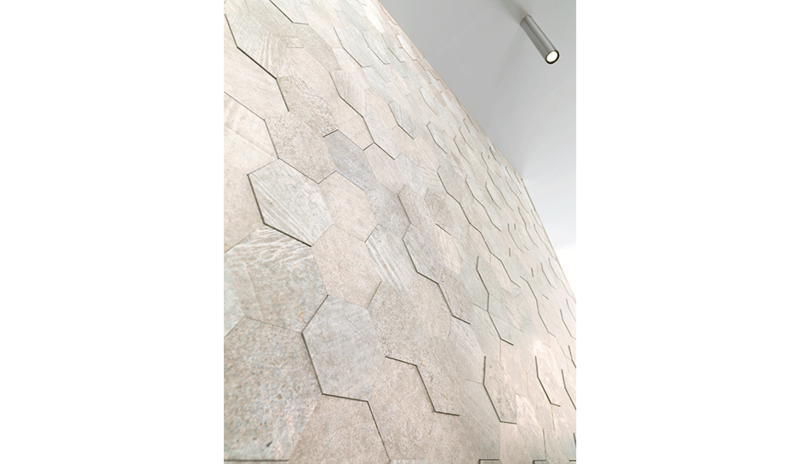 The varied patterns within each hexagon create movement while allowing the light to play off the texture. Gravity Aluminum 3D Hexagon Rose Gold is also hexagonally shaped and offers a similar 3D feel to the décor. 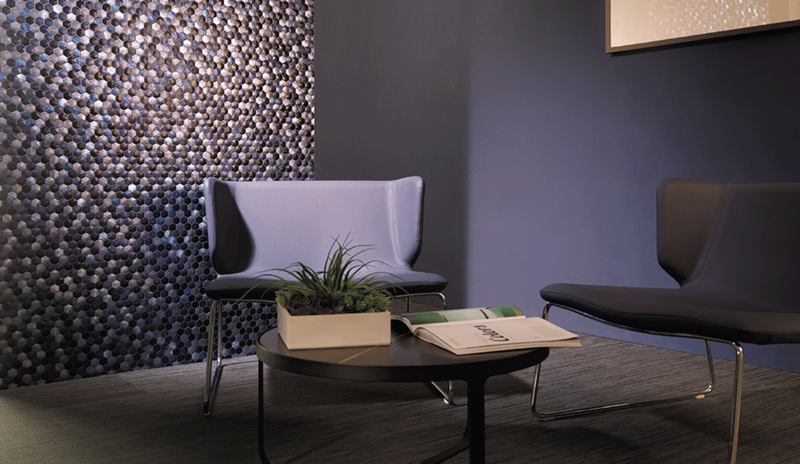 Ona Natural offers a wave-like or mountainous feel with a unique pattern that compels the eye to move across the wall as it adds visual depth to the design and gives the room purpose. 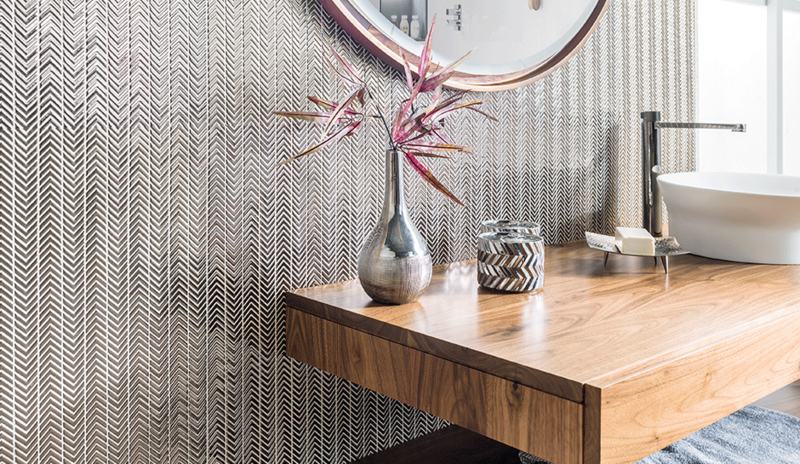 While Ona Natural moves the eye across a wall, Sydney Silver moves it up and down with its bold geometric patterns that mimic flowing water. Various patterns, textures and hues abound in geometric tiles and a perfect pattern exists for every corner of the house.